Jessying - Malaysia Beauty Blog - Skin Care reviews, Make Up reviews and latest beauty news in town! : Anyone try before Garnier Skin Naturals Light Whiten & Even Moisturizing Cream ? Anyone try before Garnier Skin Naturals Light Whiten & Even Moisturizing Cream ? Garnier Skin Naturals Light Whiten & Even Moisturizing Cream contains two effective ingredients which is the Pure Lemon Essence™ and the Snowpine Whitesoure™ which works very well in whitening and lightening dark and dull skintone. Snowpine Whitesource™ has 10 times more whitening efficacy as compared to Vitamin C. It also comes with SPH 17 PA++ sunscreen which works agains UVA and UVB. 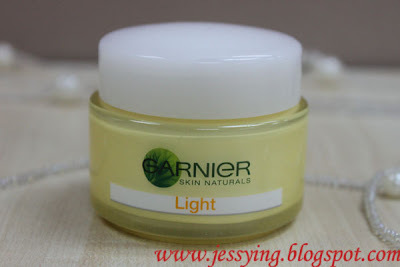 And recently Garnier Malaysia announced the Project Light result which is an observation that was done on the two participants who used Garnier Skin Naturals Light Whiten & Even Moisturizing Cream for two weeks. After 2 weeks of usage, the two participants had their dark spots lighten by 2 tones and skintone lightened by 4 tones. AMAZING! Comment : Personally I have used it for a 2 weeks, I find it a bit drying on my skin despite it comes in a cream form. And I do discover that most brightening/whitening products in the market will make the skin drier and I wonder why. Unfortunately I do not think my skin tone or dark spots are lighten yet at this point. If I do , will definitely update and share with you guys here. 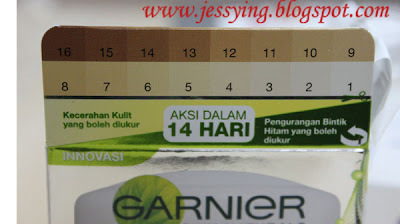 This Garnier Skin Naturals Light Whiten & Even Moisturizing Cream is selling at RM 19.90 for 50ml at major pharmacies. Anyone try this before and have their skin lighten ?? Do share with us here!